How to get the "What The Hell *Are* You?" achievemet in Battlefield 3 video guide. Written by William on October 27, 2011 and posted in Uncategorized. So this one is easy. Boot up your copy of Battlefield 3 and select the level “Rock and a Hard Place”. Skip the cut scenes and you will evtually gain contoll. This achievement is unlocked at the very beginning of this level. 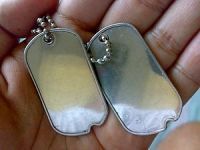 The description goes like this: “Take a Russian dog tag in the forest ambush in Rock And A Hard Place”. That’s all you have to do, get a dog tag from one of the first soldiers that attack you at the very beginning of the level. To get the dog tag you need to perform a stealth kill with the knife. Run up the hill a little, keeping behind a bit of cover so you don’t die, and find a soldier – he is probably already busy attacking your alliess so won’t bother with you too much while you run toward him – then simply get close enough and perform a stealth kill with your knife. Don’t worry if you fail on the first soldier, there are at least 3 or 4 of them here to kill and if you kill them all just resart the level again. Interesting note: The achivement name “What The Hell *Are* You?” is a little nod to the 1987 film Predator, google it.